The Old Cow Sheds are modern cottage, which has 3 bedrooms and 2 bathrooms. It is home from home with a warm feel. Steve's and Zoe's Sheds are semi detached and available separately or together for parties of 1 to 13. Dale End farm is an 18th Century period farmhouse situated in the heart of the stunning Peak District within easy reach of Bakewell, Chatsworth house, Haddon Hall, Buxton Opera House, Matlock Bath, Carsington Water and many other attractions. The small holding is nestled in a gentle rolling valley at the tail end of Gratton Dale a National Nature Reserve. It is extremely peaceful and relaxing. There is also a en-suite shower room to the main bedroom. The property has been tastefully decorated throughout to ensure maximum comfort and relaxation. It benefits from a fully fitted kitchen with integrated appliances including dishwasher, washing machine, fridge, induction hob and fan oven for the foodies. There are lawns, patios and ample space for parking. Fields surround Dale End Farm and the grounds are ideal for children. Dale End is ideally located for walking, cycling and sight seeing. This truly is a lovely location, it is very peaceful with plenty of outdoor space for children and adults to enjoy. There is something here for everyone. Steve and Zoe purchased Dale End Farm in December 2015, after a whirlwind year including our marriage and later the birth of our daughter. The renovation started in February 2016 with the support of local tradesmen and materials. It was completed in May 2016 after an intensive restoration programme. We have a black poodle dog called Rupert, 3 alpacas called Pedro, Pablo and Alfi. Dale End farm is an 18th Century period farmhouse situated in the heart of the stunning Peak District within easy reach of Bakewell, Chatsworth house, Haddon Hall, Buxton Opera House, Matlock Bath, Carsington Water and many other attractions. The small holding is nestled in a gentle rolling valley at the tail end of Gratton Dale a National Nature Reserve. It is extremely peaceful and relaxing. In the heart of the Peak District Dale End Farm is secluded and very peaceful. The countryside is breath taking with rolling hills and fields. There are alpacas, hens and ducks all here. Enclosed garden fenced for safety and dog security. A lovely place to stay, just a short drive away from Bakewell. The renovation is to a very high standard with everything you’ll need. We would like to return at a later date with a slightly larger group and my wife and I would definitely recommend. Thanks for your help. We had a lovely stay in Zoe and Steve's converted barn/cow shed. The property is perfect for a few days away with plenty of room for a family of 5. Very peaceful location, which feels remote but also close to Bakewell, Matlock and more. Great to meet both Zoe and Steve, family and the chickens, family of ducks and lovely dog. 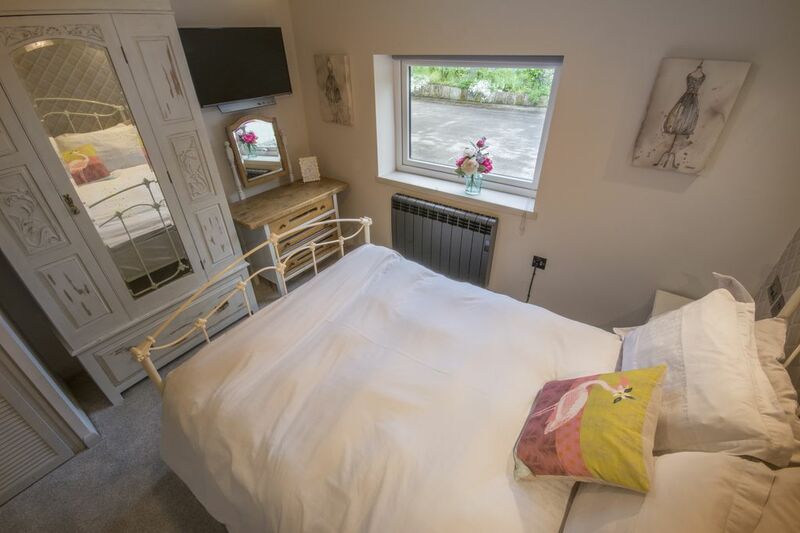 This stunning converted cow shed has been renovated to the highest spec with every single aspect of your comfort considered, high quality mattresses, plump hotel pillows, professionally laundered bedding, beautiful view, stunning walks, everything is perfect except for one thing....the resident dog! He came to call on us several times during our stay, pooping on the lawn, peeing on our walking boots by the front door but the biggest issue was his presence sent my usual placid cavalier king Charles spaniels into a frenzy everytime he came to the patio window. Early morning, late night! The property is fenced with a dog friendly fence which is fabulous but is ineffective in keeping out dogs. When we were inside we had to close the blind all the time blocking out all the view to prevent my dogs barking non stop at the unwelcome visitor. Peace and tranquillity shattered. Small point....big problem sadly. Unfortunately as beautiful as the location was it was a stressful stay having to listen to my dogs in constant torment. I am so sorry to hear about the issues you had with our dog. I just wish you would have said something. Is the fence or gate breached as I will ensure an immediate repair. I had no idea Rupert was being a nuisance. It is my policy to deal with issues immediately and I would certainly have done so. I will let my mum know we genuinely had no idea he was causing an issue. I will check with future guests how they feel about Rupert saying hello. Just spent the weekend at Zoe’s and Steve’s cottage. Beautiful cottage with fantastic views. Woke on Saturday to look on alpacas out of the kitchen window. Kitchen was very well equipped with all that you need. Bedrooms - usually I don’t sleep very well away from home but real comfortable beds with luxury pillows gave me a wonderful nights sleep. Fantastic walks near by which built a hunger for a meal in a pub in Bakewell. Cottage is a little tricky to find - but that’s partly my own fault as I was so busy at work the day that I left, that I didn’t read the helpful e mail from Zoe. Well worth a visit. Gorgeous views sat looking out of window at the horses and alpaca’s, just perfect. Also, got shown a chick just hatched the night before. Awesome!! Newly renovated, so all very smart and tidy. But rooms a little cramped (en-suite shower room hardly big enough to get into) - it would have been better as a two bedroom unit. But lovely location with great places to walk and cycle, and even a stream for paddling and swimming just a couple of miles away. Lots of good eating places in Bakewell. Friendly owners, and alpacas in the field. Nice sitting area outside. Nowhere to put wet shoes / muddy boots. En-suite shower room needs a towel rail, clothes hook and mirror.